Happy Bloggers Challenge Friday! Thanks to those who played along with the Stencils Challenge last week. The challenge this week is Easter. I created my card using Our Daily Bread Designs Custom Vintage Flourish Pattern Dies and ODBD Custom Ornamental Crosses Die. I added a verse from the He is Risen stamp set to the inside of my card. When die cutting the ODBD Custom Vintage Flourish Pattern (background), I placed the largest center die in the middle so that it would die cut the center panel out. This die cut panel is popped up on dimensionals for added depth. The ODBD Custom Ornament Crosses Die was cut from White and Black card stock, I traced the largest cross on Brushed Silver and hand cut that, then layered the cross die cuts as shown. I added a Silver Gem to the center of the cross, and a few around the center opening. I stamped a verse from the He is Risen stamp set on the inside of my card in Ranger Black Archival. If you'd like to play along with this weeks Bloggers Challenge, please link back to this post on your blog and mention you created your card for the Bloggers Challenge Easter Challenge. Please add your link using the Link Tool below, your link should be a direct link to your Bloggers Challenge Post, use your name as the Title. Please do not link to cards that were created prior to the challenge date. Entries not linking properly, or backlinked will be removed. If you have the captcha enabled on your blog, please consider turning it off, as it makes it so much easier to leave comments. Gorgeous, Lisa! Love all the intricate die cut elements and the elegant color combination. This is very elegant, love that you kept it to black and white. Your card is absolutely stunning!! 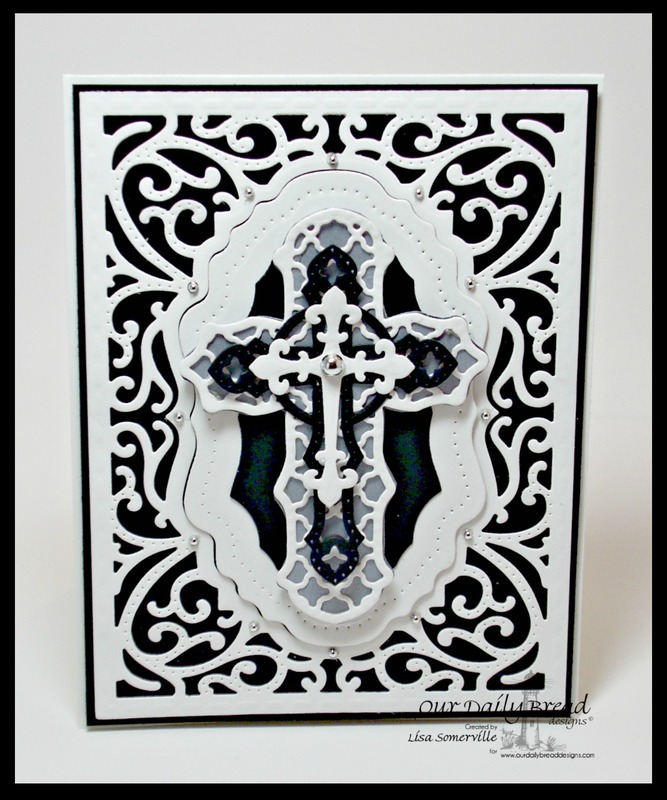 I LOVE the white and black and the layers of crosses.. Just beautiful!!! Thanks for another fun challenge!